Noryl® homogeneous polymers are known for their excellent mechanical, thermal, and electrical properties, as well as their light weight and extremely high dimensional stability. A modified alloy of PPO (polyphenylene oxide) and styrene, Noryl® plastics are easy machine and fabricate. Upland Fab has extensive experience in Noryl® machining, and can provide the high precision 3D parts your application requires. Noryl® plastics exhibit low moisture absorption and low thermal expansion, making them some of the most dimensionally stable thermoplastics available today. Noryl® offers very high impact strength, along with excellent flame resistance and insulating properties across a broad temperature range. It can be used continuously in applications with operating temperatures as high as 220°F (104°C). Noryl® poly plastics are easy to fabricate and machine, and, thanks to its unique chemical composition, is one of few non-metallic materials that can be electroplated. Select Noryl® plastics are FDA-compliant for food contact. Common applications for Noryl® plastics include electrical components, housings and insulators, vaporizer and scrubber parts, medical/surgical implements, telecommunications components, water pump parts, and many more. 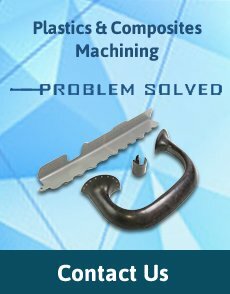 With decades of experience and state-of-the-art multi-axis machining technology, Upland Fab manufactures high quality, high precision parts from Noryl® plastics. Our advanced CNC machining systems enable us to maintain tight tolerances and perfect repeatability from the first piece to the ten-thousandth and beyond, while minimizing time-consuming handling and fixturing processes. Even highly complex parts can often be completed in a single operation. Using DPD/MBD processes (Digital Product Definition, or Model-Based Definition), we can work directly from your CAD models when machining your Noryl® poly plastic parts. This capability helps us ensure the precision and accuracy of the machining process and eliminates the possibility of errors. This ultimately gives you more accurate and less costly parts. Because effective communication is a key component of any successful project, Upland Fab provides consistent updates throughout the entire process. You’ll work with a single point of contact from the first step of your project to the last, and we’ll provide the information you need, when you need it. Upland Fab machines premium quality parts from Noryl® plastics. Request a quote to get started on your project, or contact us to learn more. Since 1970, Upland Fab has been providing top-flight plastic and composite machining in Southern California. Contact us today to discuss your Noryl® plastic project or request a quote to get started.